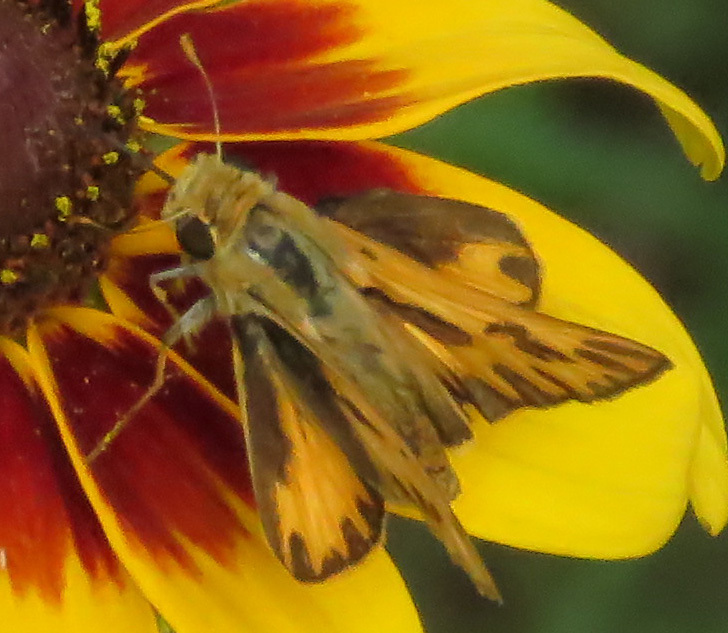 The Brown-eyed Susans are in bloom, and they are busy places in the insect world. 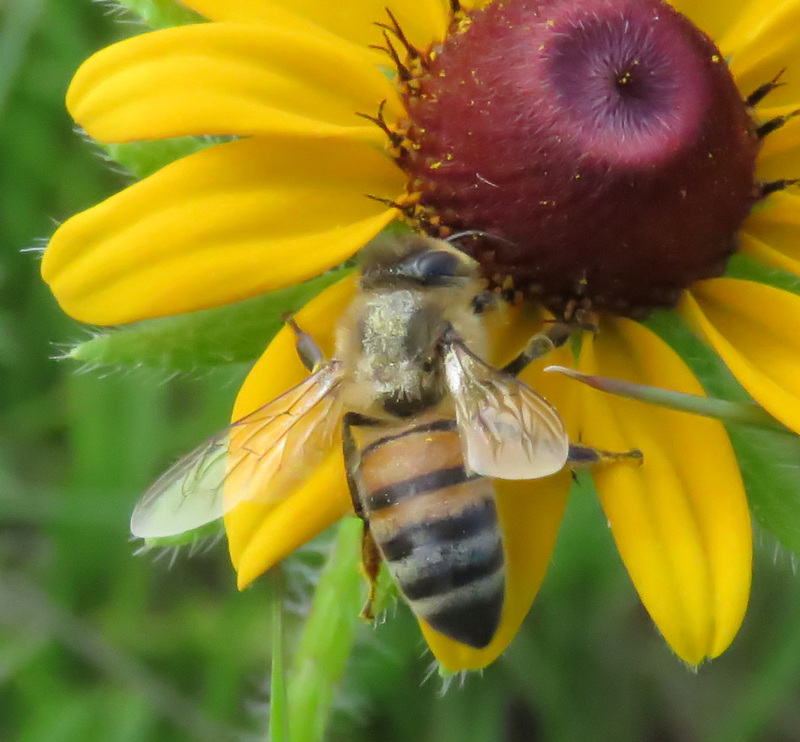 This time of year there is so much wildlife moving around, I can barely keep up with editing my photos, so I did not get identifications on all the insects here. Rudbeckias (Rudbeckia hirta), also called Brown-eyed Susans, and Black-eyed Susans. 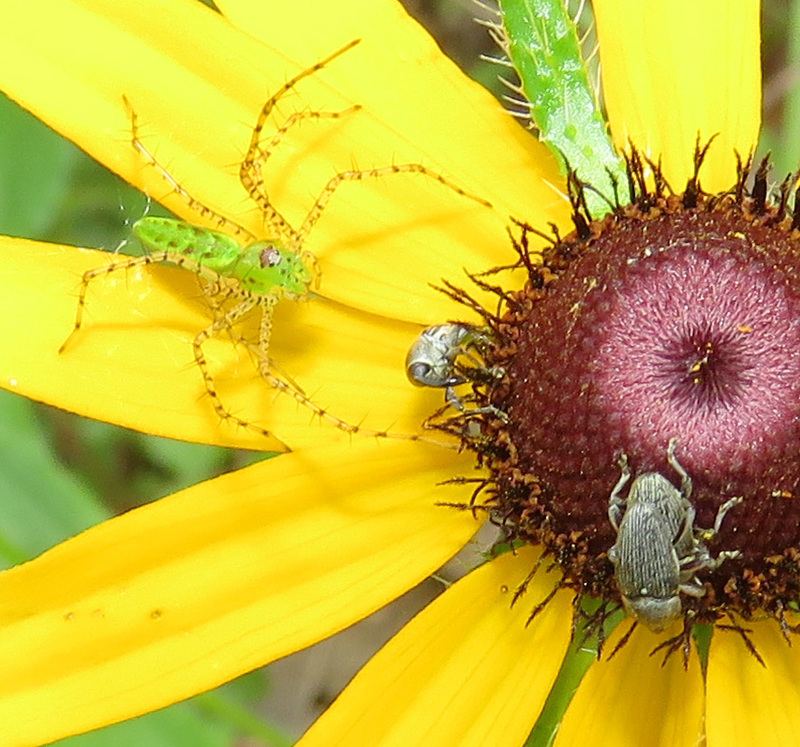 A young Green Lynx spider creeps up on some insects that I think are weevils. 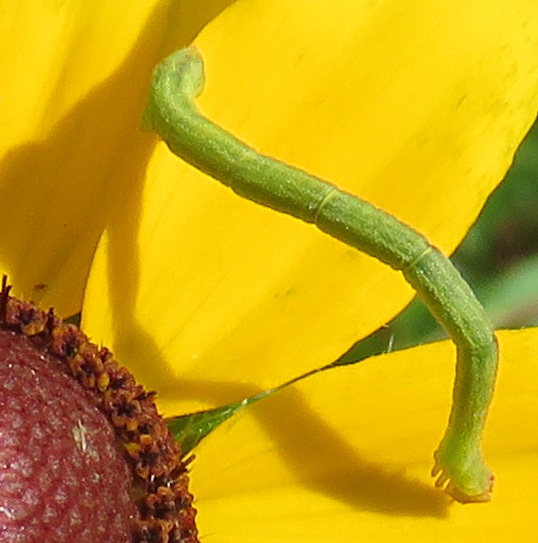 A flower crab spider stakes a claim. 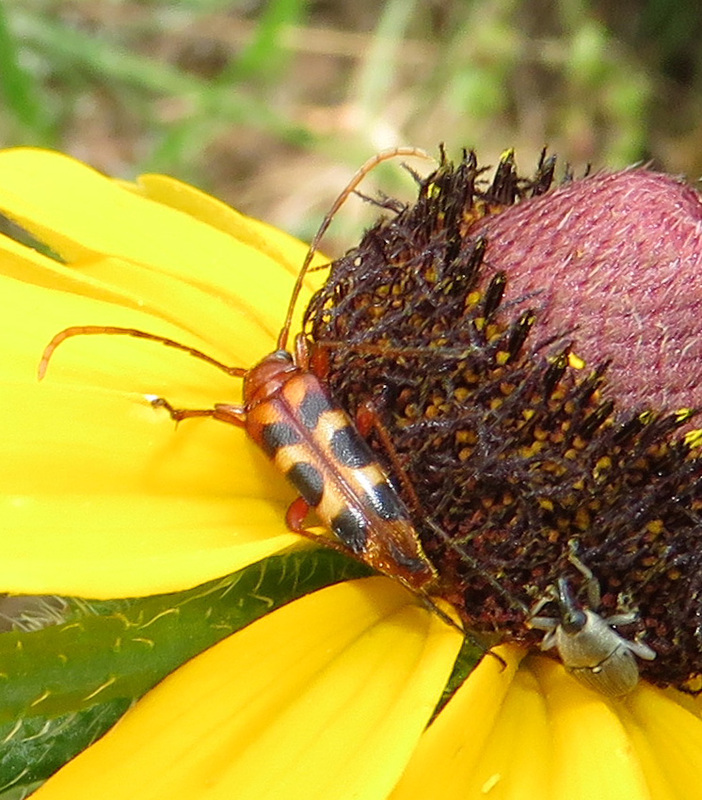 Mothly remains beneath a flower crab spider. 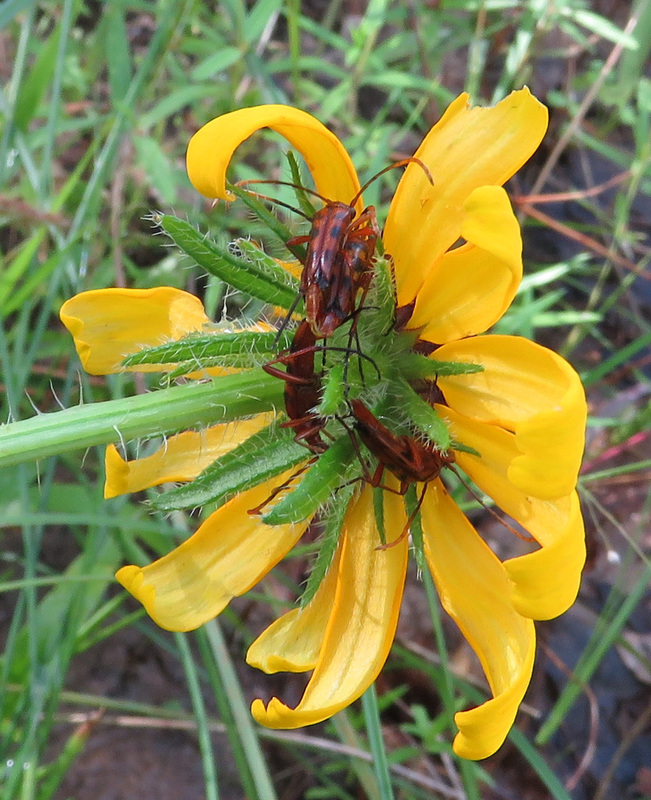 Long-horned flower beetle (Typocerus sp.) and one of those possible weevils. 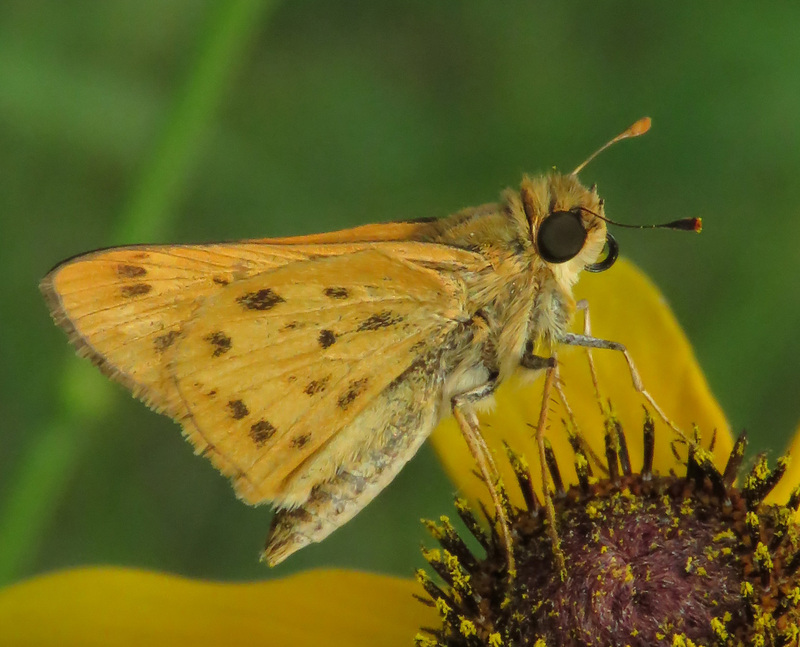 Fiery Skipper, Hylephila phyleus, ventral view. Birthday cake for a butterfly. 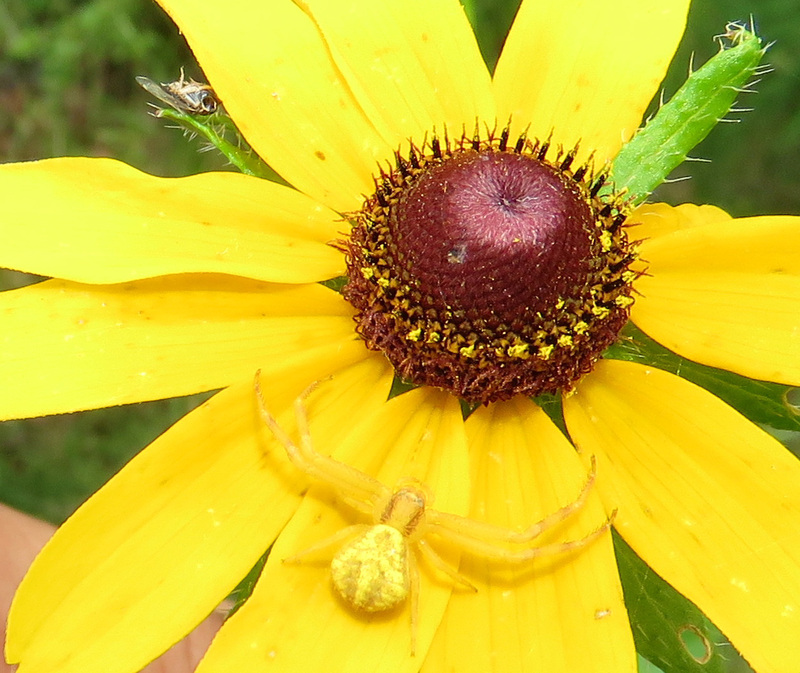 Crab spiders are sit-and-wait predators that commonly perch in, on, or near flowers and prey on visiting insects. They do not use webs to capture prey, but courting males of at least some species wrap their prospective mates loosely in silk. 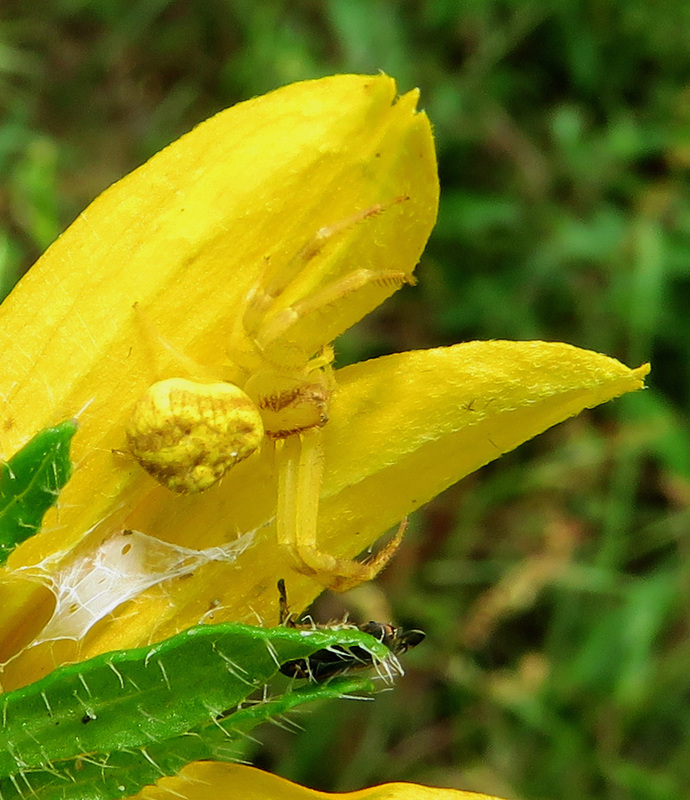 So here what I always wonder when I see crab spiders: They match the color of the flower they are on. But how do they get over to that flower? Apparently they aren’t floating over on silk. Where are they before the flowers are blooming? 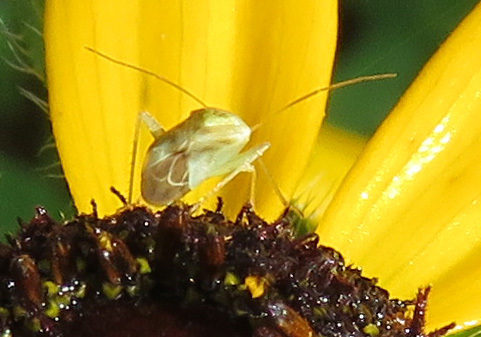 Are they scrambling around in the greenery, very noticeable in their bright yellow? Do they stake out a flower while it is a young, short plant, climb up, and just wait for the bloom? 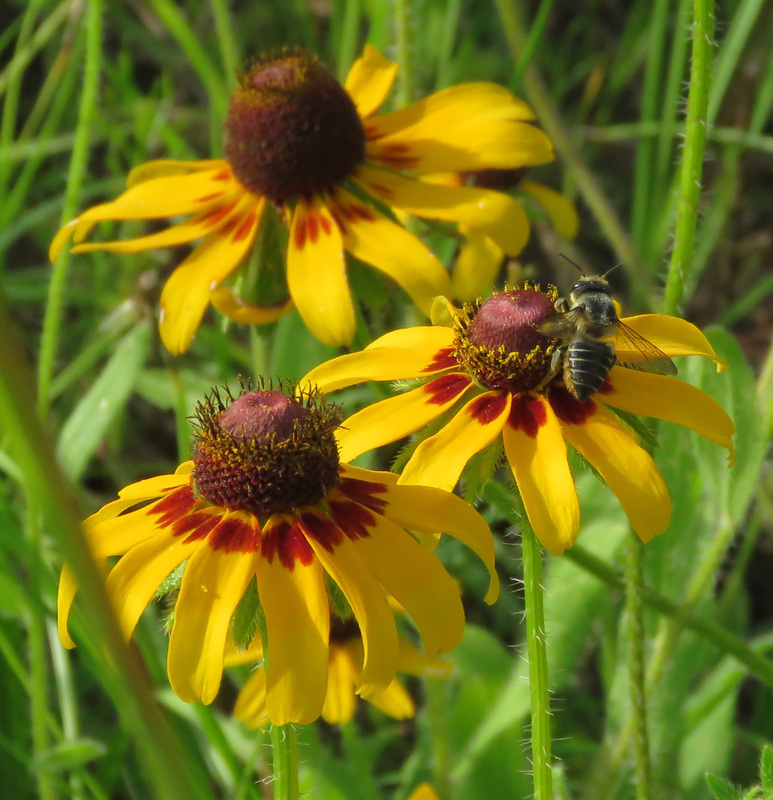 The Brown-eyed Susans don’t bloom heavily every year, but they are everywhere this year. I love to take a close look at all the life dramas being played out in these tiny worlds. Amazing photos. Love that there is so much going on if you just take the time to look. It’s a full blown Shakespeare drama out there! Oh my gosh, that would be a fun post to write. Beautiful photographs! 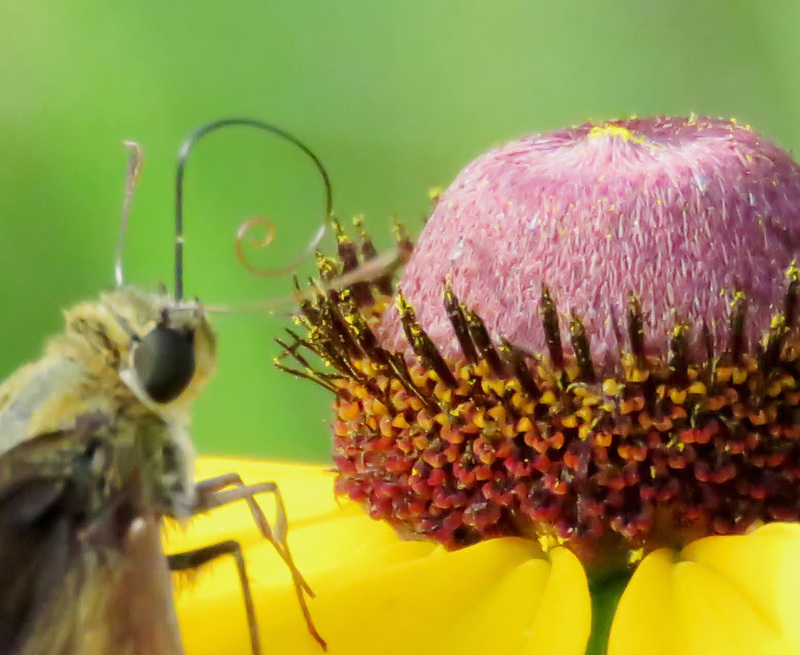 Seeing the insects so up close and personal is amazing. Thank you. The more I look, the more incredible things I notice! It’s amazing how fuzzy and furry some of these insects are!